Home > Tax Blog > Individuals > What does my PAYE coding notice mean? What does my PAYE coding notice mean? If you have recently received a PAYE coding notice from HMRC, you may be wondering what it means and what you should do with it. This can be a complex topic, and if you are confused you are certainly not alone. Therefore, the aim of this blog is to help you to understand your coding notice and any actions that you may need to take. Firstly, PAYE stands for “Pay As You Earn” and is the system that is used by your employer to deduct tax directly from your wages or salary. In order to ensure that your employer deducts the correct amount of tax, HMRC issues a PAYE code to your employer (and to you through a coding notice) to provide the relevant information. The PAYE coding notice essentially tells you your tax code and explains how HMRC has formulated it. The code is a combination of numbers and letters. This section of the PAYE coding notice gives the details of any tax-free amounts that you are entitled to. Common examples of tax-free amounts include your Personal Allowance and Personal Pension Relief. Further details about the allowances are given in the notes section of the coding notice. You may also receive some income that is taxable and will reduce your tax-free amount. This is included below the tax-free amounts in the PAYE coding notice. Common examples include benefits from your employer (e.g. medical insurance or a company car), state pension, and tax that is owed from a previous tax year (known as adjustments). The number in your tax code is formulated by deducting any reductions from your tax-free amounts. The last digit of the remaining tax-free amount is then dropped. For example, if your total tax-free amount was the Personal Allowance of £11,850, the number at the beginning of your tax code would be “1185”. This informs your employer that you are entitled to £11,850 tax-free pay per year, which they can apportion monthly or weekly. L You are entitled to the basic personal allowance. M Your spouse/civil partner has transferred £1,185 of their personal allowance to you using the marriage allowance. N You have transferred £1,185 of your personal allowance to your spouse or civil partner using the marriage allowance. S You are a Scottish taxpayer. T There are items in your tax code that HMRC need to review each year (e.g. if your personal allowances are reduced to nil or HMRC decided that there is no tax that should be deducted). 0T There is no Personal Allowance. K Where your reductions add up to more than your tax-free allowances, these are treated as extra income which is subject to tax and a letter K is placed before your tax code. The last digit is still removed to form the number in your tax code. BR This is often used for second employments where the basic rate should be used and there is no tax-free amount available as this is allocated against your main employment. D0 This is used if HMRC anticipate all income from that specific employment to be taxed at 40% (higher rate). This often occurs if you have two jobs and one of them uses all of your tax-free allowances and 20% rate band. D1 This is used if HMRC anticipate all income from that specific employment to be taxed at 45% (additional rate). This often occurs if you have two jobs and one of them uses all of your tax-free allowances and 20% and 40% rate bands. Further details of the letters used in your tax code are given in the notes sections of the PAYE coding notice. from your employer or you were previously on an incorrect tax code, amongst other circumstances. If you start a new job and you don’t have a recent p45 to give to your employer, you will be placed on an emergency tax code (1185W1, 1185M1 or 1185X). This means that you will be taxed on all of your income above the basic Personal Allowance. HMRC will then update the code automatically after you have given your employer the details of your previous income. 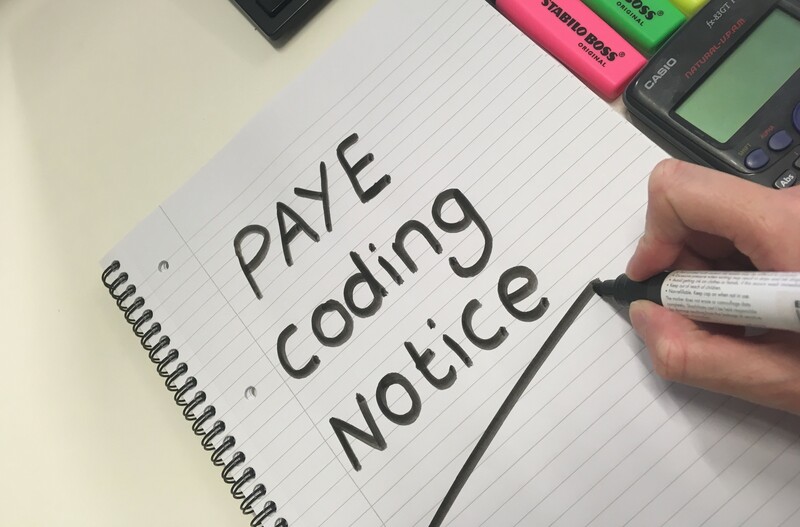 If you receive a PAYE coding notice, you should check that the information is correct using the guidance above and your payslips/pension advice slips. If there is anything missing (e.g. allowances that you are entitled to or employee benefits that you are receiving), you should contact HMRC as soon as possible either by phone or post. If the information in the coding notice is correct, you do not need to take any further action and you should keep the coding notice for future reference. If you are required to file a Self-Assessment tax return, you will need the coding notice to complete this. If you need any further help in relation to a PAYE coding notice, please contact a member of our team.